A book giving its wielder power over the dead has been stolen from a fellowship of mages that has kept the powerful relic dormant for centuries. The thief, a crafty, power-hungry necromancer, intends to use the Book of Lost Souls to resurrect an ancient race and challenge Shroud for dominion of the underworld. Shroud counters by sending his most formidable servants to seize the artefact at all cost. However, the god is not the only one interested in the Book, and a host of other forces converge, drawn by the powerful magic that has been unleashed. Among them is a reluctant Guardian commissioned by the Emperor to find the stolen Book, a troubled prince who battles enemies both personal and political, and a young girl of great power, whose past uniquely prepares her for an encounter with Shroud. I both love it and hate it when I enjoy the first book in a new series. I love it because I have the thrill of knowing that even when I reach the last page there’s still plenty more where that came from . . . and I hate it because what do you mean I have to wait until next year for the second one?! After just a few pages I knew that the Chronicles of the Exile would be (yet another) series I’d be following. I’d seen this book reviewed on several blogs I follow, and was completely pulled in by the overwhelmingly positive comments as well as numerous comparisons to Steven Erikson (my favourite author) and Glen Cook. And I can totally see where these comparisons are coming from. For a start there’s a whole host of crazy-powerful supernatural beings, the understated yet chilling descriptions of which strongly reminded me of the Taken in Cook’s Black Company. Then there are the sort of quirky, rock-hard, darkly humorous characters you’d expect to find dwelling in Erikson’s Malazan series, not to mention long-lost ancient races and interfering gods using the world as their own personal chess board. And there’s also a dark, gritty undertone – the sort of grimdark sensation that none of the characters are ever going to catch a break – that put me in mind of Joe Abercrombie’s excellent First Law trilogy. But, as easy as it is to say “fans of Cook/Erikson/Abercrombie will love this book,” When the Heavens Fall is not as easily pigeonholed as that. Turner has taken many much-loved aspects of these kinds of fantasy and has used them to embellish rather than define his own work; a sort of homage as opposed to a blueprint. While admittedly it was these kinds of parallels that drew me in from the beginning, the thing that actually kept me reading was the patient and gradual build-up to a final convergence which, while not quite as climactic as I’d hoped, was nonetheless well-done and satisfying. The climax itself and the form it will take is deliberately signposted right from the beginning, but the routes by which our characters arrive there are sufficiently twisted that, while we can guess what will happen, we’re entirely unable to predict how it will happen. Having the entire plot of the novel building up to a single moment is somewhat risky – especially with sequels on the horizon – but I found it refreshing, a bold change from the many sprawling fantasy epics I usually read. The author uses the alternating points-of-view of a small handful of characters to great effect, switching between them at varying points within each chapter to build momentum and create tension. I personally found all four point-of-view characters to be unfathomable and unpredictable: while this meant that I didn’t quite connect with the characters as much as I would have liked, it did keep me constantly guessing what they would do next, with many pleasant (and nasty!) surprises as a result. Yes, When the Heavens Fall is somewhat slow to begin with. But once it gets going there’s no stopping it; and it really gets going once it hits the halfway point. There’s a notable change of pace at around the two-fifty page-mark, and the story shifts up several gears from the moment the characters’ stories first begin to overlap. The characters themselves are compelling if not always sympathetic: a particular favourite of mine is Romany, the self-indulgent-yet-badass high priestess whose witty and irreverent verbal exchanges are a constant source of entertainment. The big climax is enjoyable if slightly drawn out, and for every problem resolved there are another ten questions still needing answers: the author has done a great job of making his readers clamour for the next book without quite leaving us on a cliffhanger. What do you mean I have to wait until next year for the second one?! 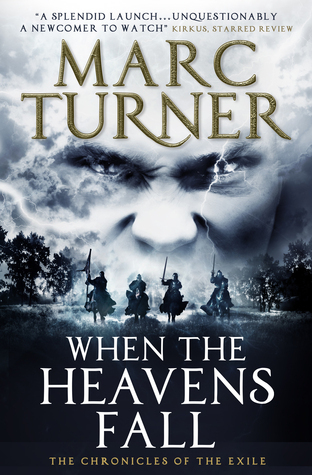 Many thanks to Marc Turner and Titan for providing a copy of When the Heavens Fall for review. Glad to hear you enjoyed it - such a fun book, I can't wait for the next one. This one didn't blow me away, but I'm intrigued about where the story might be going. Will probably read the next book if I get the opportunity.